When covering transfer rumours from abroad, one of the hardest jobs sometimes is to know if the information is original or coming from other source. Newspapers from all over the world run with rumours, and forget to credit where they come from. Sometimes, they only credit at the end of the story, making us wonder where they got all the rest from. 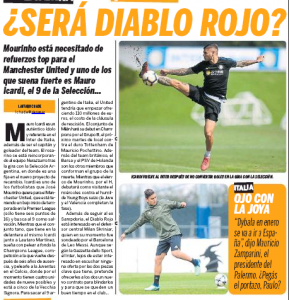 Olé gives a good example of it today, as they have a piece saying that Manchester United would be interested in Mauro Iccardi from Inter Milan. It’s the biggest sports newspaper in Argentina, and we take them pretty seriously when they write their exclusives. Without claiming the info as their own, they say that Mourinho wants a new centre-forward, and to land Icardi, Manchester United would have to spend €110m to activate his release clause. The problem is that at the end of the story, they mention that the manager would also be interested in Milan Skriniar. And that’s where the Italian media shows up. Olé writes that according to Gazzetta Dello Sport, Inter don’t want to sell any of them. So does Olé know something about the chase or not? Is the entire story from Gazzetta or the Argentine sources know something about the Icardi chase? We’ll never know, unless Olé brings some updates soon.